On Sept. 5, 2016, the New York Mets signed former NFL quarterback Tim Tebow to a minor league contract. Photo from Sports Illustrated. Five years since Tim Tebow and “Tebow Mania” flooded mainstream media, electoral politics, and religious discourse, the genuflecting born-again Christian is relevant in American sport culture once again. Though Tebow no longer throws fluttering passes in the NFL, the barrel-chested southpaw now crowds the plate at First Data Field in Port St. Lucie, Florida for the New York Mets in spring training. On September 5, 2016, the Mets signed Tebow to a minor league contract that included a $100,000 signing bonus. Stadium 2, Indian Wells. Photo by Courtney Szto. More than 2,000 years ago, Palm Springs’ first residents were the ancestors of today’s Agua Caliente Band of Cahuilla Indians. One of the many Cahuilla bans, the Agua Caliente existed as peaceful hunters and gatherers, living off the land, and adapting to the extremes of desert summers and mountain winters…The Cahuilla tribe first encountered non-Indians in 1774, as Juan Bautista de Anza’s expedition traveled through the area. In 1853, a government survey party mapped Palm Springs and its natural hot springs mineral pool – now the site of the Spa Resort Casino – and established the first wagon route through the San Gorgonio Pass. The Cahuilla culture was decimated with the 1863 smallpox epidemic that killed thousands. The NCAA Division I Men’s and Women’s National Basketball Tournaments tip off this week, bringing together players and spectators from around the world. Commonly known as “March Madness”, these annual tournaments have come to be seen as one of the biggest performance platforms for young basketball players from both the United States and, increasingly, across the planet. Generating more than $1 billion in advertising revenue alone, the NCAA basketball tournament has drawn more attention globally thanks to international broadcasting, digital technology, and the rise of international (non-U.S.) “student-athletes” at U.S. colleges and universities. In this article, I’ll discuss some noteworthy international players in this year’s tournament in light of the debate set off on college campuses nationwide by President Donald Trump’s policies surrounding immigration. Team USA’s starting 11 before a friendly match against Romania, November 2016. Photo from YouTube. 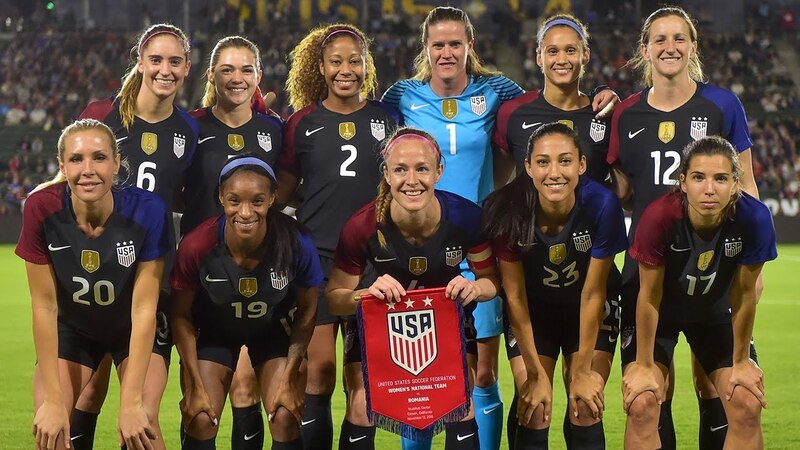 The United States Women’s National Soccer Team will take the field on March 1 for the SheBelieves Cup. With no upcoming major international tournaments, these matches will be the team’s most publicized events of 2017. Though the team’s success has been rightly celebrated as an achievement for women in sports, there has been far less analysis about the racial and ethnic diversity of the players. Prior to the 2015 World Cup, several journalists noted the team’s overwhelming whiteness, but this discussion largely took a back seat to female empowerment narratives and Title IX salutes that followed their victory, celebratory parade, and subsequent time in the spotlight. In December 2016, a league-appointed spotter had Connor McDavid controversially removed from a game to be assessed for concussion symptoms. Photo from Yahoo Sports! Sexual violence in college sport represents an important problem that coaches and administrators must address. According to the Chronicle of Higher Education, the government has conducted 365 investigations of colleges for possibly mishandling reports of sexual violence since 2011. A simple search in the Chronicle’s Title IX database using the terms “football” and “sexual assault” yields around 250 matches for currently open investigations and 49 matches for cases that have been resolved. Further, roughly half of the student athletes surveyed in a recent study admitted to committing coercive sexual behaviors. Scholars have been investigating the relationship between college football and sexual violence for a long time, and the problem has not gone unnoticed by journalists, critics, and higher education administrators. The migration of professional athletes has entered the news once more in recent weeks. In Chinese association football (soccer), quotas on the number of foreign athletes permitted on the pitch have been implemented to curb the boom in spending which has attracted players such as Carlos Tevez, Oscar, Hulk, Asamoah Gyan and Graziano Pellè to the Chinese Super League. In further high profile news, freshly inaugurated President Donald Trump’s use of executive orders to restrict the movement of people from predominantly Muslim countries could affect the movement of athletes into the North American territory. Six months ago, the world watched on in wonder as the 2016 Olympic Games opened with a colourful ceremony in Rio de Janeiro’s iconic Maracanã stadium. Just over two weeks of heart-stopping drama, superhuman performances, incredible feats of power and precision and one lying swimmer later, it was all over. Thomas Bach, president of the International Olympic Committee, closed the Rio 2016 Olympic Games claiming that “history will talk about a Rio de Janeiro before and a much better Rio de Janeiro after the Olympic Games”. Sexism and the Super Bowl: What Can We Learn from Female Sports Fans? As NFL fans gear up for Super Bowl LI between the New England Patriots and the Atlanta Falcons, some fans are apt to feel more included in the broadcast than others. Advertisers, as critics have long noted, tend to assume that American football fans are straight men. Many long-awaited and expensive Super Bowl ads tend to be, well, pretty sexist. While the most egregious examples of sexism in Super Bowl broadcasts and advertisements seem to be decreasing as the NFL tries to acknowledge the presence of women fans (at minimum as a new marketing demographic), many women continue to feel left out of the Super Bowl spectacle.